released 1999 Musical Tapestries Inc.
Blessings of Beauty takes the listener on a exquisite journey of Jewish music-old and new. A unique compliation of instrumental settings of songs and choral works by renowned and beloved composers, it brings together Broadway and traditional Yiddish folk tunes, liturgical and flamenco-inspired Ladino song settings, music from a Grammy and Emmy award-winning television score and the elegance of the Renaissance. Its breathtaking beauty and atmosphere transports the listener -- from Billy Joel's heartfelt Lullabye (Goodnight, My Angel) and the tender, stirring Yiddish treasure Oyfn Priptichik, to the cool blues of Kurt Weill's Kiddush, the eloquent Benediction by Italian Renaissance composer Salamone Rossi and the inspirational, reflective In My Own Lifetime from The Rothschilds by Jerry Bock, the acclaimed American Broadway composer of Fiddler on the Roof. Following years of international acclaim, Blessings of Beauty has been rereleased with a new cover and design by Karen Leon.The image featured on the album is that of a Mexican sunflower and a migrating Monarch butterfly. The CD has been included in the soundtracks for the Emmy award-winning documentary A Hidden Life--broadcast on PBS--and Walking God's Paths, co-produced by the National Council of Synagogues, The United States Conference of Catholic Bishops and Boston College. The special roster of composers brought together here are Billy Joel, Morton Gould, David Amram, Jerry Bock, Lazar Weiner, Richard Neumann, Andre Hajdu, William Sharlin, Kurt Weill, Leyb Yampolski (arranged by Zalmen Mlotek), Salamone Rossi and Julius Wolfson (arranged by Max Helfman). "Today I heard your CD and it's terrific! 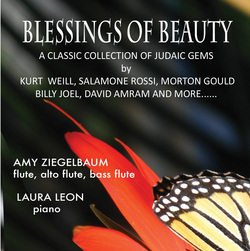 The flutist, Amy Ziegelbaum, has a beautiful sound and technique and you have an equally excellent technique, with a wonderful arranger's ear, providing fresh approaches harmonically and often melodically--making each piece sound quite unlike the versions of the respective pieces as we've heard them before. It's high level, beginning to end. Yasher-koyekh!"